Stainless steel curved door handles on backplate. Backplate 172mm x 42.5mm, lever length 120mm, projection 62mm. 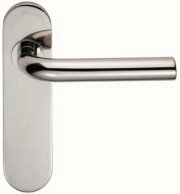 Available in dual finish of polished stainless steel and satin stainless steel lever, on a polished stainless steel backplate. Contract safety lever for office, public, and commercial applications, in 304 Grade stainless steel. Complies with Fire Certification FD30/60 requirements and DDA requirements. Can be used with both British standard and DIN Standard Locks. 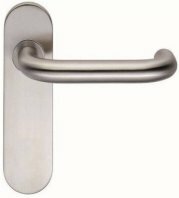 DIN Locks are the European standard with a larger Lock Centre measurement of 78mm on Bathroom Locks, and 72mm on Euro Locks. 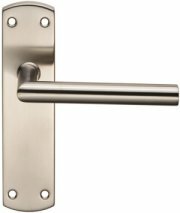 Backplate 170mm x 45mm, 8mm depth with a 19mm diameter return to door lever. 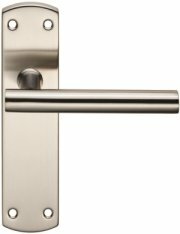 Contract straight lever for office, public, and commercial applications, in 304 Grade stainless steel. Complies with Fire Certification FD30/60. 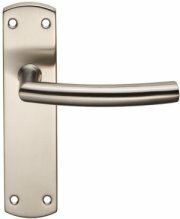 Backplate 170mm x 45mm, 8mm depth with a 19mm diameter straight door lever.